EW have revealed the first images from director and co-writer Nikolaj Arcelâ€™s adaptation of Stephen King's epic series of books The Dark Tower. 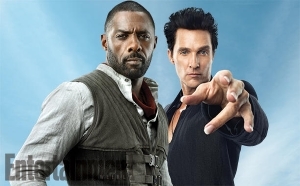 The film stars Idris Elba as Roland and Matthew McConaughey as the Man in Black. In very broad strokes, "The Dark Tower" was Stephen King's answer to epic fantasy. Inspired by Tolkien, King wanted to write his own fantasy series but was compelled to not go the route that so many fantasy authors go and set it in a faux medieval setting. Instead, he chose to use the mythical American myth of the old west. Of course, those who are familiar with the books know that the story takes the reader to all kinds of worlds and times. Directed by Nikolaj Arcel and produced by Akiva Goldman, Ron Howard, Brian Grazer, and Erica Hughes, The Dark Tower will be released on February 17th, 2017. So psyched for this! McConaughey is a great fit for Flagg (especially after seeing him in True Detective), and I reckon Elba will nail Roland's brooding, determined demeanour. Do we have any word on how this film fits into the timeline of the whole series? That's a BIG question. I've only read the first and second books and I know the series is sprawling and connects to other King books. I can't imagine it works as intricately. Needs to stand alone and set stuff up. Big job. I like the Casting so far! I think with Ron Howard involved it will be great film! I only read to book four. I believe that was Wizard and Glass. Not sure if this film is drawing of the three or what. But great they are going to play around with the Mythology. Crawls up out of the surf, looks at Elba.